If a number near the line is single and makes more than half of the length, one can paint several squares in the middle. To do that it is necessary to superpose extreme left position of group of squares above extreme right. The place, where groups of squares intersect, will have painted squares. If in the line there is a painted square, distance from which to the left border of the crossword is less than the meaning of the first figure – than you can paint several squares on the right. For this we shall count the meaning of the first figure from the left border of the crossword – all the squares to the right from the deciphered one can be painted. The same method works for the last figure and the right border of the crossword – you can paint squares on the left from the deciphered one. If in the line there are painted squares, which can be definitely referred to particular figures, there is an opportunity to put crosses in the squares “inaccessible” for any figures. Most often this method is used when you notice a square (or several squares) whish can refer to the first or to the last figure only. There are situations when in the line there appear areas, marked by crosses, in which none of the shown figures can fit. Thus, such areas are filled with crosses. We can act the same way when this area appears at the beginning/ end of the line and the first/ last figure doesn’t fit in. In situations when there are some unpainted squares divided by an empty square it is necessary to check if it may contain a painted square – in case it contradicts figures shown in the line, the square must have a cross. Sometimes there are situations when a painted square in the line can refer to two variants of positioning groups of squares only. 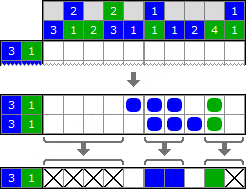 Squares which in both variants of positioning remain empty are marked by crosses. In colour crosswords it is necessary to take into account colours at intersection of the squares. It allows to exclude a big number of possible positioning groups of sqares. An important peculiarity is that squares in the first line can be either empty or painted in colour of the first figure in the column. The same method works for the last line as well – it has either empty squares or squares painted in colour of the last figure in the column.